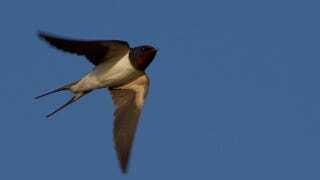 Swallows that nest on roadsides appear to have evolved shorter wings to help them maneuver better and avoid cars, claim a team of scientists from the University of Tulsa in Oklahoma. The researchers have been studying cliff swallows that live near roads, and observed that the number of vehicle-killed birds has declined over the past three decades—despite the fact that the overall population has increased. The researchers then compared the wings of birds killed by cars to those killed accidentally in nets used to catch birds for study. The results, published in Current Biology, show that the wings of vehicle-killed birds have lengthened over time, while those which died accidentally in nets—and are representative of the entire population—developed shorter wings over time. That's enough for the researchers to claim that, overall, the population is evolving to better avoid cars. Shorter wings, they say, allow the animals to "make a 90º turn more rapidly".